Ask any Pro-Motocross Racer and he will tell you that dirt bikes need to be light, durable and agile. This is essential when off-roading or competing. Because these 4-stroke dirt bikes will be used primarily for trail and track riding, all the bells and whistles that add crippling weight was excluded. This off-road racing philosophy was applied when designing the ZX1 Extreme 4-Stroke Dirt Bike. At the center of every great dirt bike is its frame. The ZX1's CAD (Computer Aided Design) XRD Frame is the stiffest in its class with heavy-duty welds and perfect placement of cross members and braces. The lightweight alloy material provides instant responses to the rider's every input, enhancing balance and stability that is crucial in off-road conditions. The extra-long suspension travel creates a higher ground clearance for obstacles as well as giving the ZX1 Dirt Bike extra flexibility in tackling bumps, jumps and anything you can throw its way. The power of the 4-Stroke Dirt Bike Engine has been tweaked to give out gobs of torque necessary for the challenges off the pavement. This is not a street bike engine placed on a dirt bike frame like most other mini dirt bikes you may have seen. This engine was tuned specifically for the ZX1. Harnessing all that power is a heavy-duty, off-road, 4-speed semi-manual transmission that is able to bang out shifts under any conditions quickly and reliably, while the extra seals block out elements found on the roughest of trails. Kickstart the ZX1 Extreme and you will hear the high-pitched Supercross Exhaust. A quick blast through any trail will reveal this dirt bike's well-balanced design and superior handling. The competition compound dirt bike tires and the trail-tested extra-long-travel suspension system will inspire confidence for the rider to go faster and faster. 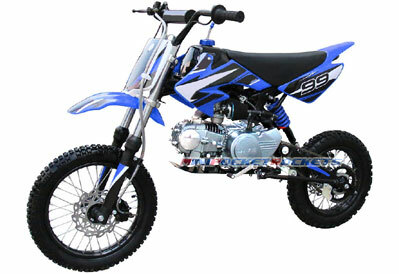 Having ridden numerous different dirt bikes in all kinds of conditions, the pros at MiniPocketRockets believe that this is the best handling and most responsive dirt bike in its class, bar none. The power-to-weight ratio and the availability of torque at low RPMs is unrivaled by any other. Whether you are casually riding in the back woods or blowing away your competition on the track, the ZX1 blazes the trail where others will follow behind. Included Free with the ZX1 4-Stroke Dirt Bike: Tools (sockets, screwdrivers, allen wrenches), Tool Case, Owner's Manual / Certificate and our free extended warranty.